Two excellent, 72-count assortments of flat taklon brushes, each in a plastic canister. Both short handle and long handle assortments contain 12 each of six different sizes. 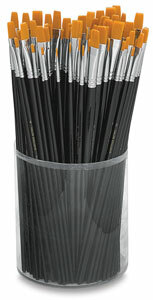 A great value for artist or classroom!